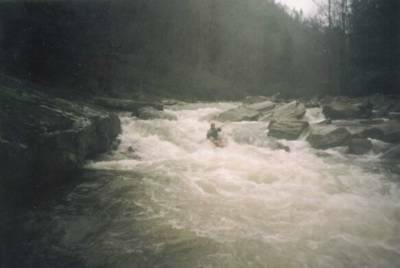 Photo by Kevin Miller: Laurel Creek near Hot Springs, NC 12/14/02 @ +3"
No, conquering rivers cannot compare to the grace that comes from agreeing to be carried away downstream. When all you've ever known is dry ground, the descent into untamed rapids becomes the purpose, not the take-out or destination. When you think highest ground holds your soul it is just then you feel the plunge into the churning, dark water. No one stays dry forever. We all end up downstream one day... it's just that some will end up not knowing how they arrived, thinking all the while they were doing something. All we can do is drop our paddle in the water, the river does the rest. I love this post, Isaiah. A favorite saying of mine is "One need not push a river. It flows naturally to its destination." Things go so much more smoothly when we stop trying to swim against the current and simply float.